The inaugural Tiger Beetle Trail Run thru' Ainsdale pinewoods, organised by time2runevents, was held on Sunday. This was the 3rd race in the club's new Trail Race Grand Prix series and being very local, attracted 27 of our senior runners. The race was run in a series of waves, with 22 Southport Waterloo runners in the first wave. Francois Rafferty was the overall winner in 38:00 with a good run from Boyd Park taking him into 4th place overall in 41:41. Tracey Allan was 3rd Female overall in a time of 46:05 and Andrew Hudson finished in 23rd place in 46:21. Francois, Boyd and Andrew won the team prize and free entry into next year's event. Full results |Trail GP Table. The 4th race in the GP series is the Rivington Trail 10 miler next Sunday. Southport Waterloo athletes Clare Constable and Ian Fitzpatrick represented Great Britain in the World Masters Indoor Athletics Championships in Torún in Poland. Starting early on Wednesday, Ian was in heat 3 of the M55 800m at 8:30am and was not at all sleepy finishing in 2:18.75 - his second fastest ever time, missing out on the final by less than 2 seconds. The event was won by Giuseppe Ugolini from Italy. On Thursday evening Clare was in the final of the W45 800m. This conveniently clashed with a club training night and our junior athletes gathered round an iPad to watch, Clare running 2:23.91 and finishing just outside the medals in 4th place, the fastest European. The Gold medal was awarded to American Sonja Friend-Uhl. Well done to Clare and Ian. Masters athletics is supported well by our club, with Milly Smith currently out in Australia intending to compete in the Aussie Masters soon. The re-arranged Sefton Year 5/6 Cross Country Champs hosted by Southport Waterloo were held by the North Promenade, Blundellsands, in late afternoon sunshine with a light wind - a far cry from the gale force winds sweeping in of the Irish Sea on the original date, two weeks earlier. Re-arranging an event carries difficulties for everyone and we are grateful to both the schools and our own volunteers who could make it on Wednesday for their continued support. Not unexpectedly, the 250 runners was a little down on last year but the venue proved popular - if we could just guarantee the weather! And the competition was impressive with several very close finishes. Measurement on the day showed the Year 5s running 1.5 kms and the Year 6s 2.2 kms. First off were the Year 5 Girls with Izzy Brooks from Norwood romping home in 6:13. Great Crosby's Felicity Fletcher and Norwood's Ellie Perkins battled for 2nd place with Felicity just edging it, both girls getting a time of 6:31. Aintree Davenhill won the team competition ahead of Freshfield and Great Crosby. Next, the Year 5 Boys gave us the biggest field of the day, 93 finishing the course. We had another Norwood winner here, Jamie Simpson crossing the line in 5:43. Chris Hawkins, Trinity St Peters, was 2nd in 5:51 and Thomas Dent, St Luke's Formby, was 3rd in 5:59. St Jerome's were team winners ahead of Great Crosby and Aintree Davenhill. Tianna Chambers from Farnborough Rd won the Year 6 Girls' race in 9:46 ahead of Great Crosby's Eve Hannaway in 9:58 and Farnborough Rd's Jasmine Kneen in 10:04. St Luke's Formby were team winners with Farnborough Rd 2nd and Freshfield 3rd. Finally, the Year 6 Boys took on their 2-long lap course and after the 1st lap there was nothing to chose between the front four runners, well ahead of the rest of the field. By the Finish, Luke Loughlin from St Georges emerged as the winner in 9:00 with team-mate John-Paul Cavanagh just a second behind and Elliot Cray from Woodlands settling for 3rd place in 9:03. Woodlands went on to take the team medals ahead of Great Crosby and Farnborough Rd. Great Crosby won the Southport Waterloo Challenge Trophy for the 8th time. Freshfield Primary was the winner of the Sefton Cup for smaller schools. Many thanks to the schools who came down to Blundellsands for a great afternoon's running. Thanks ,too, to Southport Waterloo people who helped set up and run the event and to Eleanor James and Lucy Milling our very able hares. The 3rd Grand Prix event of 2019 took place on Sunday 24th March. There were 10 club seniors taking part, 175 runners total. First home for Southport Waterloo, David Wright (43:27) and 6th overall, followed by Keith Lunt(44:45), Boyd Park(44:59), Stephen Ward(45:17) all 4 finishing in the top 14. Neil Silcock(52:09), Stephen Flanagan(53:01), Malcolm Teale (53:18), Tracey Barlow(56:00) Mark Gillan (57:04), Sue Stewart(1:01:45). Great little event raising money for a good cause, sunny conditions, if a little breezy, great scenery, run on quiet country roads with great marshalling provided by the host, Garstang Running Club. Ten club athletes took advantage of the first Track & Field meeting of the outdoor season; at the Blackpool Open Meeting in Stanley Park Arena on Saturday. It once again proved to be a very popular meeting, going on until after 5pm. Last year, this meeting was photographed with snow on the ground. Just a flurry, I admit, but Saturday's weather was much more pleasant with some Spring sunshine and little wind. There were several PBs, some new events as youngsters moved up an age group and a star performance was Under 17 Bekki Roche, recently joined from WESPA Fire. Bekki set two club records from her three events! Bekki threw 54m 01 in the 3 kg hammer to win the competition and smash the club record. In the 3 kg shot competition, she was again the winner with a best of 13m 65 to improve on her own club record. She had to settle for 2nd place in the discus with 25m 84. None of these these performances are PBs so clearly our club records are set to seriously increase. She now holds the U17W shot and hammer records. The discus club record for an Under 17 Woman is 35m 70 set back in 1983 by Kathryn Farr. Bekki's PB is 32m 46 so that club record is well within reach. It might be a bit early in the season but Saturday's performances rank Bekki 1st in the UK for discus and hammer and 2nd in the UK for shot. Under 13 Charlotte Hughes ran her first sub 3 minute 800m to stop the clock in 2:59.4. She also ran a 200m in 33.0. Under 13 Lauren Byrne ran 12.6 for 70m hurdles, where her PB is 12.5, she put the shot 6m 47 and long jumped 3m 78. Under 13 Luke Ward ran 2:40.7 in his first 800m, ran 14.6 for the 100m and 30.2 for 200m. Under 13 Adam Byrne ran 2:47.8 for 800m, a second outside his previous best, put the shot 6m 98 and cleared 1m 24 in the high jump. Under 15 Sierra Jalloh ran two PBs. Her 100m time of 13.0 in a competitive race improved on last season's best of 13.1 and her 200m time of 26.5 compares with 26.79 run at the Northern Indoor Champs in February. Clearly Sierra is well set up for the coming season! Under 15 Amber Hughes has competed nip and tuck with Sierra over 100m as Under 13s, both with PBs of 13.1. Amber equalled that at Blackpool, finishing 2nd with both 2nd and 3rd girls given the same time. So both girls have played an opening hand in separate heats of the 100m at Blackpool. Amber also ran a 75m hurdles, moving up from the U13 70m hurdles. She was 2nd behind Warrington's Meg Corker in 12.2. Under 15 Niamh Procter ran 15.2 for 75m hurdles, cleared 1m 20 in the high jump and 4m 12 in the long jump. Under 15 Eleanor Clark ran 14.9 for 100m - just a tenth outside her PB, ran 15.5 for 75m hurdles and she threw the discus 16m 04. 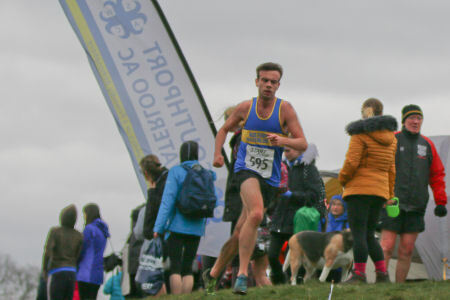 The prestigious English Schools Cross Country Championships were held on a muddy and undulating course in Temple Newsam Park, Leeds, on Saturday. English Schools used this course last year when the weather was also less than perfect. But this is the pinnacle of cross country running for teenagers so rightly a challenging event. The estate covers 1500 acres so large enough for a national event. 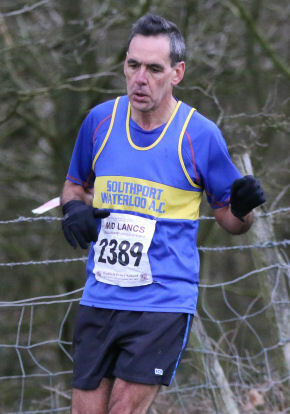 Three Southport Waterloo runners were named in the Merseyside team. 12 are named with 8 only competing in each age group, the additional 4 being effectively named reserves. Lizzy Wake was named in the Junior Girls but wasn't included in the 8 running on the day. Olivia Logan was in the Inter Girls' team and finished 1st counter for Merseyside. 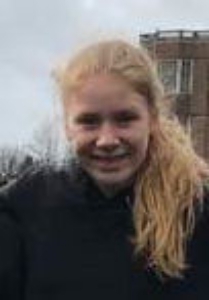 She finished 17th of 341 girls in 14:17 for her 3.7 km course, just missing out by seconds on being selected to represent England in the upcoming Schools' international in Wales next weekend. Olivia has had a brilliant cross country season and will have learned an enormous amount from competing this year against the best in her age group in the country. And Jessica Dean was named and ran in the M'side Senior Girls' team. 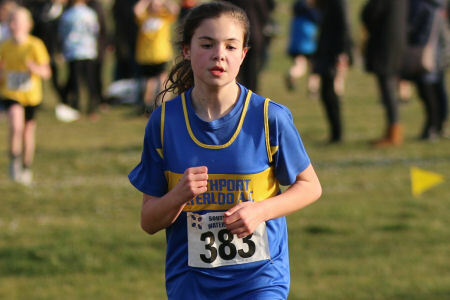 She finished 4th Merseyside counter, 178th of 315 girls in 18:04 for her 4.1 kms. Merseyside's Junior Boys took bronze team medals. Francois Rafferty ran the Chester 10K in 35:32 last Sunday, almost as fast as his 35:24 in the Southport Mad Dog in February which put him at the top of the club rankings this year. Not bad for a V50 runner! But more importantly, his Chester run has won him a place in the England 10K Masters team competing at the Simplyhealth Great Birmingham 10K on Sunday 26th May. Many congratulations to Francois and good luck in Birmingham. The BTR Liverpool Half Marathon and the Liverpool Landmarks 10 Miler took place on Sunday in less than ideal running conditions, strong winds hampering hopes of fast times. The Half Marathon is the longest established road race in Liverpool and now incorporates a 10 Mile distance, by omitting the Sefton park section. Four of our runners ran the 10 Mile distance, a race that was won by the club's Mark Dunham in 56:00, an excellent time in the conditions. Mark finished nearly a minute ahead of 2nd placed South Cheshire Harrier Mat Taylor, 57:00, and Tom Garbett 3rd in 57:12. The Women's race was won by Penny Lane Strider Liz Turner in 70:17 with Northern Masters' Alison Reid in 70:44, and Claire Haslam in 71:29. Southport Waterloo's Mari Dyson ran 1:43:50, Lesley Syms 1:44:19, Sarah Pickerill 1:44:20 and Jan Marsh 2:08:34. The Half Marathon was won by Rotherham runner Daniel Kestral in 71:01, ahead of Liverpool Harrier Alistair Rutherford in 72:56 and Manx Harrier Andrew Barron, 75:37. Sheffield's Ellen McLeod won the Women's race in 88:00, ahead of Eleanor Jones, 89:52, and Sally Waterworth, 90:16. The Half Marathon race was the 2nd race in the club's Grand Prix series and was well supported with 19 of our runners taking part. Alex Waddelove was first home for the club, running 1:25:27 for the distance. Keith Lunt also ran sub 90 to finish in 1:27:23. Stephen Ward ran 1:30:11, Keith Swift 1:30:47, Boyd Park 1:31:26, Philip Dean 1:34:33, Carl Pedder 1:37:51, Jeff Caunce 1:39:21, Mike Walker 1:40:25, Stephen Flanagan 1:43:19, Jay Oliver 1:44:03, James Brooker 1:44:43, David Marsh 1:49:00, Malcolm Teale 1:51:00, Robert Busby 1:59:17 and Mark Gillan 2:00:20. Louise Busby was our first female finisher in 2:10:23 ahead of Ellie Ireland, 2:10:23, and Emma Hopwood, 2:26:58. Stephen Ward currently leads the GP table, a point clear of Keith Lunt. Emma Hopwood is the only female to have run both GP races so far so she leads the female GP. But very early days yet. The 3rd race is the Garstang Gallop over 7 miles on Sunday 24th March. Three of our athletes took advantage of the last of Sale's indoor open meetings of the season; Luke Suarez, Stephanie Robertson and Graham Boreham. Taking the last first, Graham ran 39.45 for his first ever indoor 300m race. Undaunted by being allocated the inside lane, his was a competitive race and a good time. Luke took part in both the long jump, clearing a best of 5m 93, and he too ran a 300m, his in 38.61. Stephanie, supported by coach David Gough, came along determined to run a fast 60m in memory of her nanna who died very recently and who has followed her athletics career closely, including by live streaming from championships. She certainly met her objective with a fine run in 8.17 secs, a significant improvement on the 8.25 she has run in her last three races and smashing Lauren Brennan's 8.20 indoor Under 17 club record set back in 2007. Unless Stephanie breaks it herself, this new mark could well stand for another 12 years! Stephanie's 60m club record is in fact her 2nd of the year, having beaten her own 60m hurdles indoor club record at the England age group Indoor Championships in late February. There, she got off to a great start in her heat to cross the line in 9.08 secs, qualifying for the semis where she ran 9.16. Her times have been getting faster with each outing this year and her 9.08 time replaces her previous club record mark of 9.22 set at Sportcity in early February - a massive achievement! And Stephanie 60m hurdles mark was not the only club record set at the England Indoor Champs. Under 17 Bekki Roche was also competing, in the Shot where she threw a best of 13 metres. It was only a matter of time before Bekki got her name in the Southport Waterloo club records and I'm sure it wont be the last. And that put was good enough to give Bekki an England bronze medal and a first mention in the club's Roll of Honour. Also competing in the England Champs was Ben Apps who set a Season's Best of 13m 63 in the triple jump, just 4 cms short of his Personal Best. And Under 15 Sierra Jalloh competed in the 200m, running 26.90. Apologies if I've missing anyone else competing at these championships. 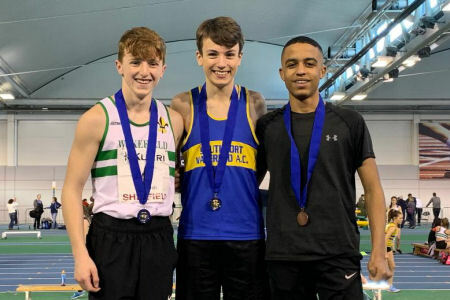 The English Institute of Sport in Sheffield hosted this weekend's England Athletics Indoor Combined Events Championships also incorporating the Northern and other Regional Athletics Championships. On Saturday the U17 Men started their two day heptathlon and the U17 Women completed the one day pentathlon. On Sunday the U15 Boys/Girls both completed their pentathlons whilst the U17 Men concluded their heptathlon. The club had 5 athletes in action, U17 Men Drumayne Moore and Sam Coupland and U15 Girls Niamh Proctor, Amber Hughes and Katie Piercy. To add to the atmosphere on the first day our clubs younger athletes were also taking part in the Tom Pink relays and provided lots of thrilling entertainment and plenty of noise and support. On Saturday Drumayne and Sam had 4 events, 60m, Long Jump, Shot Putt and High Jump this was followed on Sunday with 60m Hurdles, Pole Vault and 1,000m. Drumayne had a good Saturday, 60m completed in a new PB of 7.99s, 5.85m in the Long Jump another PB (Drumayne always achieves amazing measurements in Long Jumps at the England events having previously set his best in last Summers England Decathlon), put the Shot 7.43m and High Jumped 1.62m another Personal Best. Overnight Drumayne was in 16th place with 1930 points. Sunday was a little trickier, hitting the first hurdle in the 60m Hurdles lead to a time of 10.81s, with a Pole Vault of 2.26m Drumayne finished his heptathlon with a very creditable 1,000m in 3:13.82. Total points score of 3,054 was good for 17th place. Sam also had a good start, 7.88s for the 60m a new best, 5.55m in the Long Jump followed by 9.25m in the Shot another personal best and finished Saturday with a 1.80m leap in the High Jump. Overnight points total of 2,155 points and 12th place, 2nd in the Northern Athletics Championships. Sunday continued positively with a new PB of 9.43s in the 60m Hurdles, a Pole Vault of 3.06m and his time of 3:04.07 for the 1,000m is a new club record for this event. Sam's points total of 3,805 is also a new club record and with it the Northern Athletics title and recognition of the club's Hall of Honour. 11th overall in an event won by Giffnock North AC’s Murray Fotheringham with 4,967 points, second best All Time score for this event and age group. Niamh, Katie and Amber had all helped on Saturday with the Tom Pinks relays, Sunday was their turn to pull on their Southport Waterloo vest and compete. The u15 Girls indoor pentathlon is: 60m hurdles, Long Jump, Shot Putt, High Jump and finally 4 times round the 200m track for 800m. Katie wasn't 100% in training the week before the event and unfortunately in the first event the 60m Hurdles Katie was clearly not right, crossing the line in distress in a time of 10.72s, she unfortunately had to withdraw. We wish her a speedy recovery. Niamh's pentathlon started with a 60m Hurdles in 11.40s, her Long Jump of 4.36m was followed by a Shot of 5.52m, High Jump of 1.32m and concluded with a 800m in 3:00.99. A points total of 1892 and 42nd place. Amber's day started with a 60m Hurdles in a new PB of 9.55s, Long Jumping 4.66m, Shot of 9.61m. Amber's High Jump of 1.50m was personal best equalling and put her in close contention for a Northern Athletics medal. 800m of 2:47.81 resulted in a points total of 2,879 is a new club record, replacing Ambers previous mark for the indoor Pentathlon. Finishing 9th overall a great result, 4th place in the Northern Athletics competition. The u15 girls event was won by Hallamshire AC’s Erin Lobley with 3,518 points. 53 girls had entered the competition and 50 started, 47 finished. A substantial field results in such a long day, it was gone 7pm before Niamh and Amber finally called it a day. 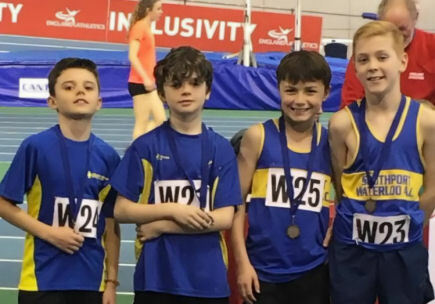 On Saturday 9th March the club's under 11 and under 13 boys and girls attended the AAA Tom Pink Relays in the excellent venue of the English Institute of Sport in Sheffield. 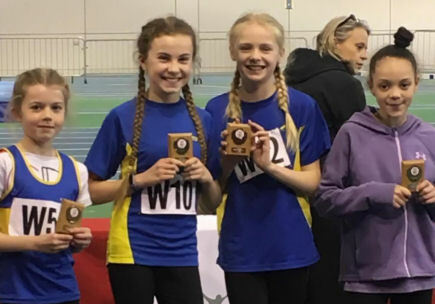 In the track events the under 11 girls qualified for the final in the Over and Under Relay and came away with the gold medals in a very exciting final (Hannah Keenan, Lucy Mitchell, Poppy Powell and Renee Adams). The boys' team took the bronze medal in their final in a hard fought race (Jack Verdin, Jamie O’Brien, Joseph Wake and Luke Ward,). We also had a number of individual event medals. Full report to follow once the results are available. Prestwold Hall estate, Loughborough, was again the venue for the CAU Inter Counties Cross Country Champs (and final Cross Challenge race) on Saturday - and a miserable day it was I believe. The course held up reasonably well but the spectator are gradually developed into a quagmire. 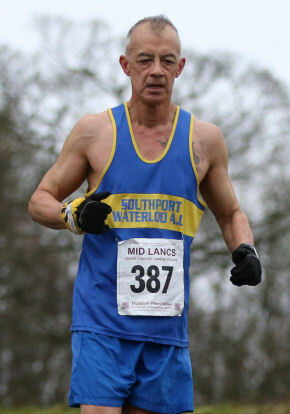 A number of Southport Waterloo runners were selected to represent Merseyside and several actually ran on the day. Emily Dean ran in the Under 13 Girls' race over 3 kms. She was 4th Merseyside counter of 8 running, 189th overall, finishing in 14.50. Olivia Logan ran in the Under 15 Girls' race over 4 kms. 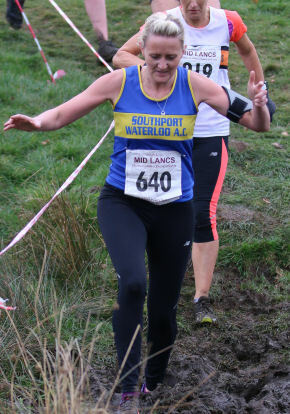 She had another excellent run finishing 1st Merseyside counter, 21st overall, in 15:26. Both Jessica Dean and Freya Walsh ran in the Under17 Women's race over 5 kms. Jessica was 2nd Merseyside counter, 152nd overall, in 23:00. Freya was 7th Merseyside counter, 248th overall, in 26:20. In the Under 17 Men's race, over 6 kms, Harry Pike was 5th Merseyside counter, 262nd overall in 23:24. 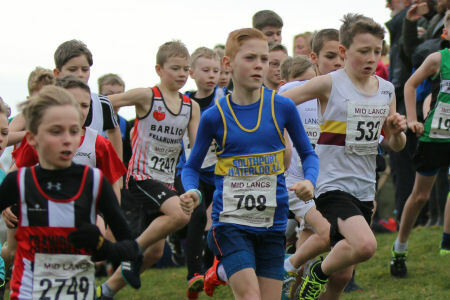 The last fixture of this season's Mid Lancs Cross Country League was held at Cuerden Valley Country Park in Bamber Bridge on Saturday. Fortunately, Storm Freya was not due to hit until Sunday evening so we were we were glad to get away with just the one short shower and breezy conditions. The course was less muddy than last time we were here and ground conditions generally good to soft. Some found the double water crossing a little deeper than usual but this is a 'proper' cross country course.. The last league meeting is often poorly attended as individual and team positions for the season are generally already decided. But numbers held up well across the age groups giving a record turnout for the season as a whole. Once again, few Southport Waterloo juniors ran here. Just seven! Our Under 11 was Luke Ward who continued to show potential as a cross country runner, finishing 5th of 86 finishers in 5:44 for the 1.8 kms. He finishes the League in 6th place and should do well as an Under 13 next season. Emily Dean and Apphia Keenan ran the Under 13 Girls' race. Emily was 18th of 53 finishers in 11:36 for 2.7 kms and Apphia finished in 13:49. Emily finishes 14th for the season. Rueben Donnelly was our Under 13 Boy. For his 3.6 kms, Rueben was 27th of 47 in 14:56. There were two runners in Southport Waterloo colours in the Under 15 Girls' race which was once again won by Olivia Logan, 14 secs ahead of the 2nd placed girl. Olivia ran 13:03 for the 3.6 kms. Millie Ireland also ran, finishing in 19:30. And our final junior was Jessica Dean running in the Under 17 Women's race. She finished 7th in 16:24 for the 3.7 kms. 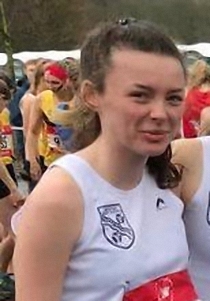 Jessica finished the league season in 4th place overall, the same position she finished in 2018/19..
Nine of our Senior Women ran at Cuerden Valley. They were led home by team manager Michelle Spencer who was 32nd of 132 finishers in 27:04. Zana Ladipo was 51st in 28:11 and Carole James, the final team counter, 58th in 28:40. Helen Lavelle completed the 5.5 kms in 29:46. Ellie Ireland was about the same time but her result is missing as this report is written. Sue Stewart was 4th L65 in 32:10, Lynne Vickers ran 33:59, Katy Coupland 34:37 and Jane Blacklin 37:53. The 'A' team would be Michelle, Zana and Carole. Going into this match, Southport Waterloo were in 3rd team place in Division 1; not a bad result bearing in mind we were in Division 2 last year. But we didn't have our fastest runners out at Cuerden and I reckon Blackpool Wyre & Fylde will have knocked us out of the team medals. In the LV35 team league, we were again 3rd going into Cuerden but I think Wigan have leapfrogged both SWAC and Clayton le Moors dropping us down to 4th for the season. So at least we have stayed up in Division 1 and Sue Stewart will take another individual award. Our other finishers were Keith Lunt, 43:41, Richard Talbot, 43:47, Keith Swift, 45:38, Rob Johnson, 45:51, Neil Adshead, 46:24, Paul Hill, 50:21, Graham Liu, 50:41, Malcolm Teale, 52:44, Mark Gillan, 56:55, Gareth Williams, 57:13, Lee Coupland, 61:48, Ian Pike, 62:09, and Graham Padden, 63:16. Francois, Steve, Peter and John won the MV40 team contest on the day. I think that means we tie with Preston overall but beat them on the tiebreaker rule for the Silver medals. Francois, Peter and John also won the MV50 team contest - which they had already won outright winning at all six fixtures. The Awards presentation evening is at Blackburn FC this year on Friday 20th April. See info. The league season may be over but there are a couple of significant fixtures to conclude the season. 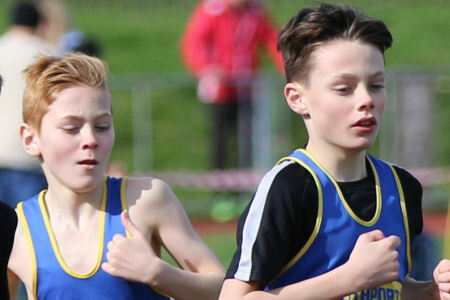 Good luck to our runners taking part in the Inter Counties next week-end at Loughborough and / or the English Schools Championships in Leeds the following weekend. And, of course, to any of our youngsters taking part in the Sefton Yr 5/6 champs hosted by Southport Waterloo on 13th March in Blundellsands.